Tel Uvirith is a Telvanni settlement in the Molag Amur region, located on the site of Uvirith's Grave. House Telvanni defends this settlement as their commissioned stronghold, although House Redoran and House Hlaalu do not think likewise. Tel Uvirith is the one and only Telvanni stronghold with Dwemer Centurions guarding it. 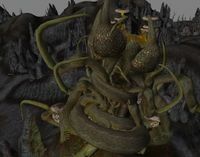 In comparison with the other two strongholds accessible in the game, Tel Uvirith fully demonstrates the arrogant expansionism of House Telvanni. While Indarys Manor (the Redoran stronghold) is located on the site of Bal Isra, right between Ald'ruhn and Maar Gan (thus in the Redoran heartland), and Rethan Manor (the Hlaalu stronghold) is on the Odai Plateau just south of Balmora (also in the heartland of its House), Tel Uvirith is a direct expansion into territory which has had no affiliation with the Telvanni. Like Tel Vos, which can be taken as a sign of imminent Telvanni occupation of the Grazelands, Tel Uvirith shows surprising signs of the House planning to incorporate the northeastern part of Molag Amur into their domain as well. Upon construction of Tel Uvirith, the Telvanni heartland of the Zafirbel Bay is more or less completely surrounded by strongholds, making them better organized than the scattered Redoran and Hlaalu strongholds, whose domains are woven into Tribunal Temple and Imperial domains. 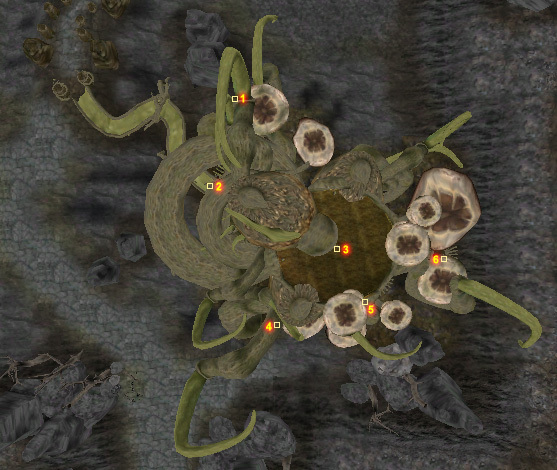 Tel Uvirith is notably much larger than the two other strongholds, although it is far more remote. It sports both a larger interior and more NPC accommodation in the immediate area, although it is the least populated stronghold. Tel Uvirith is also a great artistic, or at least architectural, victory for the Telvanni. 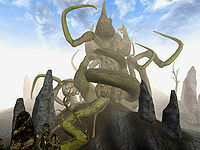 It demonstrates the ability of the Telvanni Mage Lords to grow their strongholds even in the desolate rocks of Molag Amur, an ability that seems to secure their further ambitions, probably those of a closer connection between Tel Branora and the Zafirbel Bay area, by a conquest of eastern Molag Amur from sites such as Tel Uvirith and Odirniran. The interior of Tel Uvirith is noticeably darker and more intricate than any of the other Telvanni towers. It also is one of only three towers that boasts a dungeon (the others being Tel Branora and Tel Vos). Like all the other mage-lords' towers, Levitation is vital in order to travel around the rooms of the tower's upper levels. This tower will not exist until you have advanced in the quests to start building your stronghold for your chosen house faction.